I'm making this for my son/future DIL for their wedding. 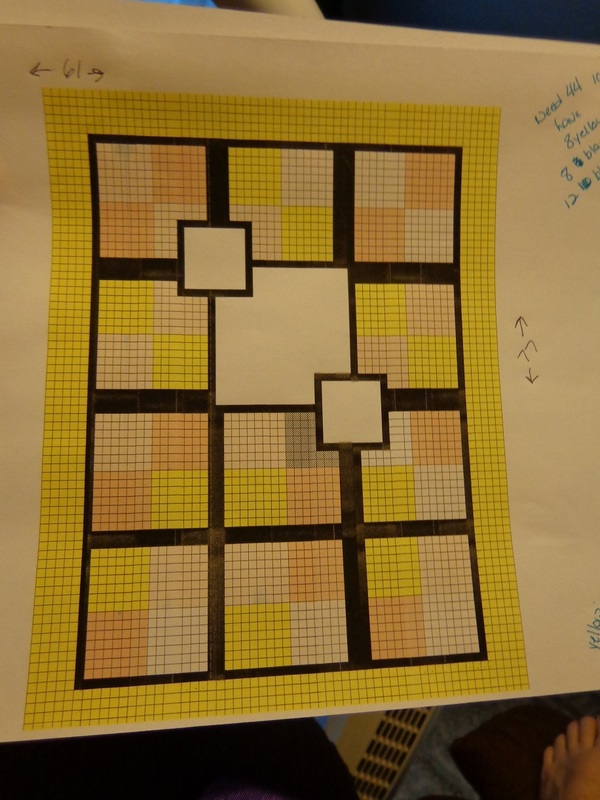 The large white square will be approximately 20" square and the small white squares will be approximately 10" squares. The bride specifically requested an initial in the large square. I'm looking for ideas of how to fill all 3 squares. Was thinking about trying to put a really light photo in the background with the initial in the foreground......suggestions...thoughts...ideas??? How would I do that, and would it look okay?? BTW, ignore the handwritten notes....they aren't accurate. Maybe the initial in the large square like bride requested and then pictures of the bride and groom in the 2 smaller squares. Are you thinking to piece, applique or embroider the initial? Probably applique.....I don't have the ability to embroider, unfortunately. Not sure what the initial is, though I am guessing it is their last name. If so ... what about her initials in one block, and his in the other? Also wondering ... since the bride requested the initial, perhaps she has a suggestion for the other two blocks. Sew many ideas ... just sew little time!! Back in the day, when they used to embroider towels, didn't they put the last name as a large initial and his first name and her first name as small initials? You could do that. Dumb question? You won't learn to embroider or you don't want to? There are some absolutely fantastic counted cross stitch letters out in the world. You can control teh size by the thread count or by slightly altering what you can find. Much more elaborate than what most of us can applique? Maybe the initial in the large square like bride requested and then pictures of the bride and groom in the 2 smaller squares. That would be my suggestion as well. Do you know anyone with an embroidery machine? Or maybe the local quilt store can embroider the blocks for you or know someone who will. Also, have you thought about fabric ink? Tape the design/Initial you want to a window then the fabric over it and use a fabric ink pen to draw in the design. Remember to heat set it afterwards by placing a paper towel over the fabric and using a hot iron (no steam) and the paper towel will absorb excess ink. Also, you need to heat set between colors. Have any artists in the family? Maybe they could draw the letters the size you want. If not, a word processing program will have letters in different fonts/styles and you can enlarge them to just about any size you want. In large Sq, the intial of the last name with his and her first name coming off the last name intiail. this would work if her and his first name of the some letter as in the last name . in the smaller block thing like the date of the wedding, date of the frist date, where the first date was, where the wedding was. love the idea you are working with hope you can make it work. GOOD LUCK. Scrapy quilts have more love in them.